I am writing from India. Today I started teaching my third Master Dog Handling Class which is being presented by the Animal Welfare Board of India, Vets Beyond Borders, Global Wildlife Resources, Jeevashram, the Brigitte Bardot Foundation and the Municipal Corporation of Gurgoan. Through this program, the humane and compassionate principles taught by Global Wildlife Resources will become a national standard for the country of India. 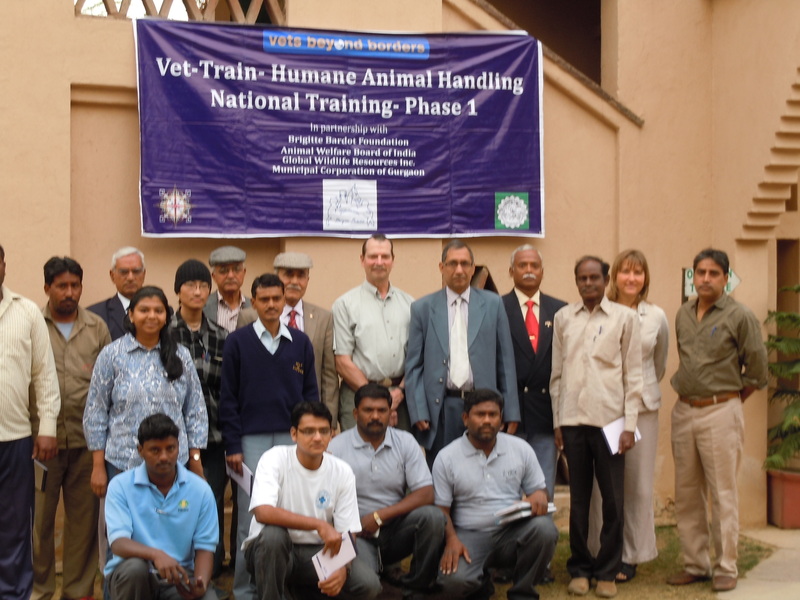 This is my fourth trip to India and I am honored to be teaching my unique form of compassionate dog handling to over 50 dog handlers from across India as part of Phase 1. For Phase 2, each student has promised to teach 20 more handlers over the next year so 1,000 dog handlers will be taught this compassionate form of dog handling which teaches not to fight the dog, to look at yourself first to calm the dog, and to use the Y pole. To help them teach in Phase 2, Global Wildlife Resources and Vets Beyond Borders will be producing a training video with DVDs for each day. The foundation language will be in English, but the students will be able to choose several languages of India. Eventually this training video will also be available in Chinese and Spanish. I will keep you posted. 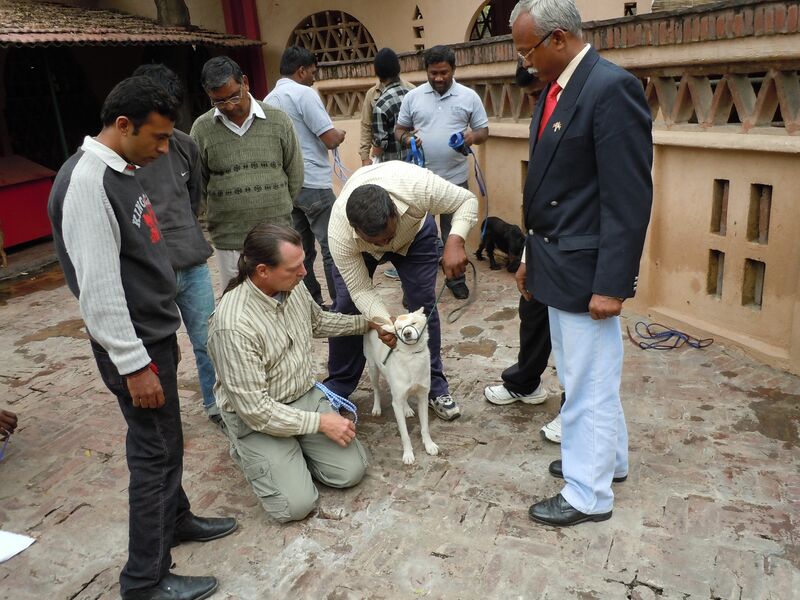 Some dog handlers in my India courses, especially those of municipal corporations, arrive without knowing any compassion for the dogs. They have been told to catch as many dogs as possible and are often paid by the dog. Some have used metal tongs to grab the dogs or the loop and pole method without being aware that dogs have feelings and feel pain just as we do. Here they are meeting fellow students who are skilled at catching and handling dogs in a compassionate way and they are learning about nets and the sack method. They are also understanding how compassion makes their work easier and safer and by the fifth day I see them caring for the dog and petting the dog as they handle it. It is quite remarkable. 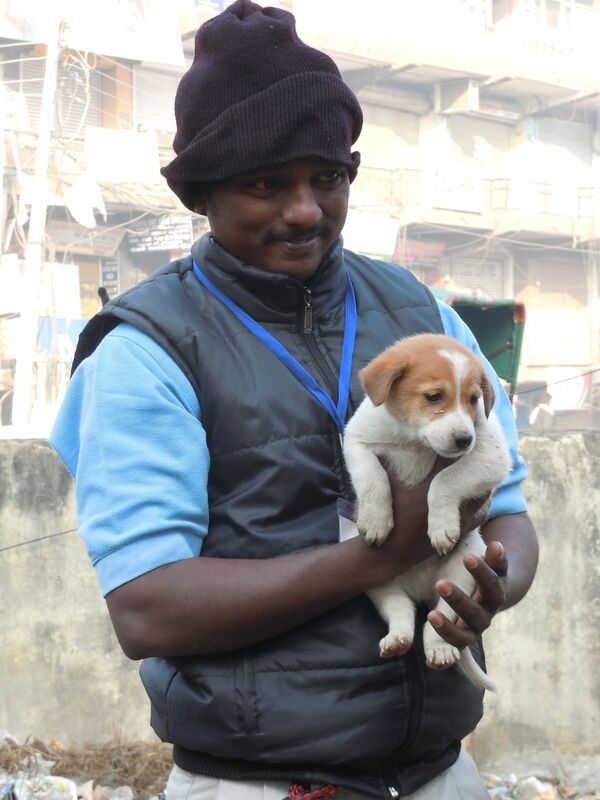 Other dog handlers in my India courses have been catching dogs for years, but have never touched a dog. They have used nets or loop and pole and have transported them in the nets or quickly dumped them in the truck. Here they are learning how to scruff to control the dog in a humane way. They are learning about the leash wrap and how to use hobbles. By learning confidence in touching and handling the dog, they also learn confidence in the net. But most important, they learn how to calm the dog by being calm and how to make the dog easier to handle by being kind to it. I must prepare for tomorrow’s class, but I will share about these classes later.